Among the grants approved recently by the Board were three TB grants to Pakistan. This article reports on the comments from the Technical Review Panel (TRP) and the Grants Approvals Committee (GAC) on the funding request from which these grants emanated. Pakistan has a high burden of TB with an estimated incidence of 270 per 100,000 and a prevalence of 342 per 100,000. In of 270 per 100,000 and a prevalence of 342 per 100,000. In 2016, Pakistan reported 356,390 TB cases (70% of its estimated 510,000 new cases). Multi-drug-resistant TB (MDR-TB) is estimated at 4.2% among new cases and 16% among re-treatment cases. The identification of MDR-TB is sub-optimal at 22% of estimated MDR-TB cases diagnosed. reach 1.24 million DS-TB patients by increasing treatment coverage from 70% to 85% and finding an additional 174,000 TB cases. The TB grants will be managed by the same three principal recipients (PRs) as the existing grants. See the table for more information. To support activities in the public sector through provincial TB programs and to procure TB drugs and diagnostics for all PRs. To implement active TB case finding interventions in 21 districts and MDR-TB care in 14 programmatic management of DR-TB sites. To implement TB case finding through enhanced engagement of the private sector in 65 districts. * The grant is managed by the Ministry’s National TB Control Program. The country coordinating mechanism (CCM) submitted a within-allocation request of $130.1 million, and a matching funds request of $14.0 million. The CCM also submitted a prioritized above allocation request (PAAR) of $150.5 million, of which $48.4 million was deemed by the TRP to be quality demand and was added to the Unfunded Quality Demand (UQD) Register. During grant making, $4.5 million in efficiencies was identified, all of which was reinvested into the grant to cover costs for diagnosis and treatment of an additional 26,000 DS-TB cases and to procure essential commodities. In its review of the funding request, the TRP highlighted a number of strengths. Most notably, the TRP said that the modules and interventions in the funding request complement Pakistan’s National End TB Strategic Plan 2017–2020. The TRP also said that the CCM made good use of this funding opportunity to cover some key program gaps, such as insufficient MDR-TB diagnostics and treatment coverage and a 30% case detection gap. The TRP said that the funding request recognizes gender differences in TB and includes some specific activities to address gender imbalances in TB case notification. 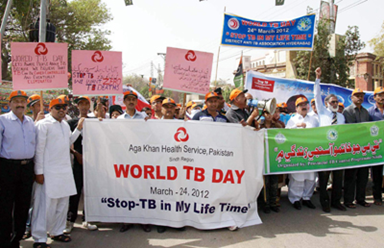 The TRP raised several concerns when it reviewed Pakistan’s TB funding request. Some issues were resolved during grant-making, while others will be addressed during grant implementation. Some of these issues are described below. ISSUE: Implementation plans for key populations were not provided. The funding request did not provide any specific details on the inclusion of key populations such as refugees, internally mobile persons (internally displaced or migrants from neighboring countries) and populations in congregate settings (prisons and detention centers). The TRP requested that the CCM develop an implementation plan on how populations in congregate settings, as well as mobile and refugee populations, will access TB prevention and care services. OUTCOME: This issue was cleared during grant making. The CCM said that a legal environment assessment and a gender assessment is planned for 2018–2019, with support from USAID and the Stop TB Partnership. The goal of these assessments is to understand the legal-, policy- and gender-related barriers that vulnerable and TB-affected populations face in accessing TB services. In addition, the CCM developed an implementation plan for key populations in congregate settings. Targets were added to the performance framework of the Indus Hospital (one of the three PRs) covering the implementation of TB screening and the treatment of prisoners. ISSUE: TB screening approaches for presumptive TB patients are unclear. Although the PR is intending to undertake systematic TB screening targeting presumptive TB patients in high-risk populations to increase TB case finding, the funding request did not adequately describe which high-risk population groups will be targeted. In addition, the request revealed different approaches to screening presumptive TB patients among implementing partners. The TRP requested that the CCM develop an outline of the process for prioritizing active case finding efforts among presumptive TB patients; approaches for targeting vulnerable groups; and screening algorithms to target symptomatic cases in various high-risk groups. OUTCOME: The issue was apparently cleared at the time of grant making; however, the grant documents did not say exactly how. ISSUE: Insufficient details on private practitioner engagement and oversight. While Pakistan is expanding plans to work more closely with the private sector on the TB response, the funding request did not clearly describe the public-private-mix (PPM) model. The TRP recommended that a formal situational assessment of the PPM activities for TB care in Pakistan be conducted to assess the contributions of the private sector. Following this assessment, the TRP said, an action-plan for 2018–2022 should be developed that integrates PPM partners and their models of care. OUTCOME: This issue was not completely resolved during grant making and will be fully addressed during the first nine months of grant implementation. The $14.0 million in matching funds covered two strategic priority areas: (a) finding missing TB cases; and (b) resilient and sustainable systems for health (RSSH). The TRP said the matching funds request prioritized identification and treatment for drug-susceptible and MDR-TB patients and expanded collaboration with the private sector. The co-financing commitments from government for the 2018–2020 implementation period of its TB grants was deemed sufficient to meet the co-financing requirements set out by the Global Fund. Global Fund support has allowed for the scale-up of case finding, strengthening of private sector involvement in the TB response, implementation of large-scale MDR-TB programs and the introduction of innovative and strengthened systems. To improve sustainability of Global Fund investments, the government has absorbed the costs of scaling up the services provided through the public health system. In addition, the government has committed to increasingly absorb the costs of first-line TB drugs from the current 50% in 2018 to 80% by 2020.
provincial TB programs will be advocating for more funding and for measures to ensure that existing and future commitments are realized.